If you are a gamer, you owe an awful lot to the noble pinball machine. It ushered in the arcade, which in turn ushered in the video game revolution, so your favorite pastime exists almost exclusively due to these ball bearing launching contraptions. 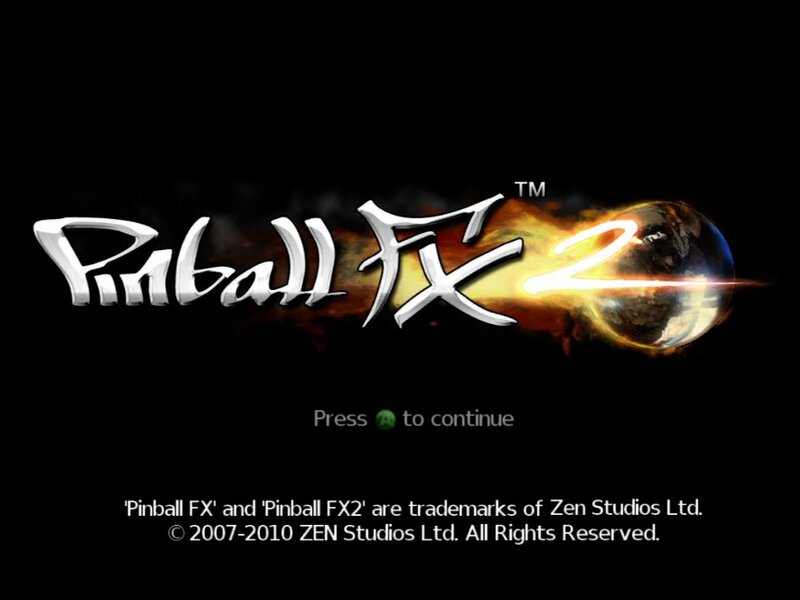 Luckily Zen Studios has finished up the Game Feast promotion with Pinball FX 2, am XBLA salute to the games that inspired the only halfway decent rock opera. Honestly, I’m floored by the graphics in this game. Pinball machines were already a visual spectacle, with their flashing lights and moving parts and shiny ball rocketing around. This game brings all of that to you with sometimes photo-realistic authenticity. Granted, the generally stationary camera and small environment leaves an awful lot of the Xbox 360’s graphics power free to work on the little things, but I was truly impressed. Like their real life counterparts, the tables are dense with color and components. 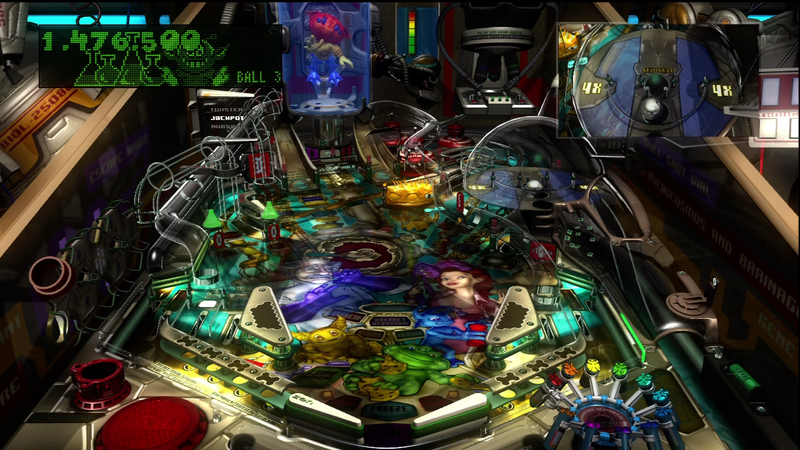 Unlike their real life counterparts, the tables included with Pinball FX don’t have to bend to the whims of physics, so the various peripheral doodads that don’t affect the course of the ball are much more animated and lively than anything you’d see on an actual machine. As a result, you’ll see a colorful genetic freak in a test chamber, or particle effects emitting from the engine of a submersible; small but appreciated digital additions to a physical game. Other than that, however, the whole experience strives to be authentic to its roots. With the exception of floating score indicators, anything you need to know that is not told to you by the board itself comes via a yellowish, low resolution simulated LED or VFD display in the top left of the screen. 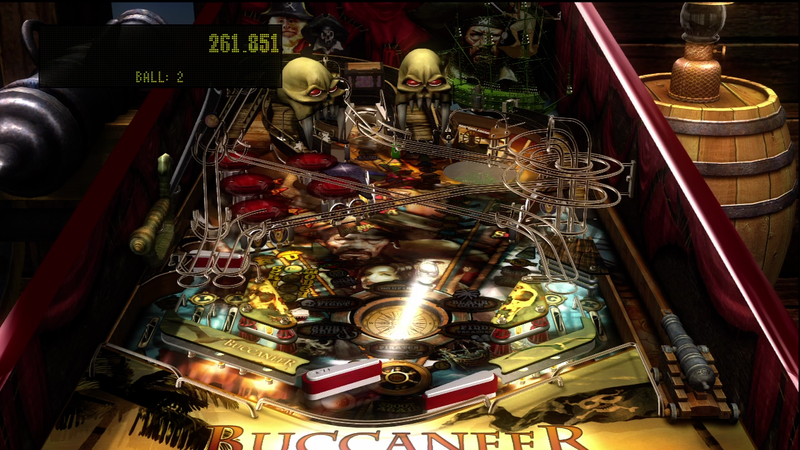 Since the playfields are cluttered, and can become rather hectic, the camera may occasionally pull back to allow a clearer view during multiball or a second view window will give you a closeup to some onscreen action, but mostly the experience is extremely close to simply standing at the edge of an actual table and hammering away at the flippers. I would hope that you’ve played pinball at least once in your life. If that is the case, then you know how Pinball FX 2 is played. The triggers control the flippers, and the A button launches the ball. That, plus a control stick waggle to nudge the machine, are the only control you need, but not all you have. There is also a slow-mo button for training yourself. Pretty neat. Other than that, it is just like the physical game, and that goes for behavior along with control. This isn’t so much a pinball game as it is a pinball simulator. The real game is all physics, after all, and fairly elementary physics at that. It stands to reason then that it could benefit from the same treatment that flight and driving have gotten on modern hardware. The high accuracy simulation doesn’t lead to the ball moving smoothly and surely along the table, though. Quite the contrary. 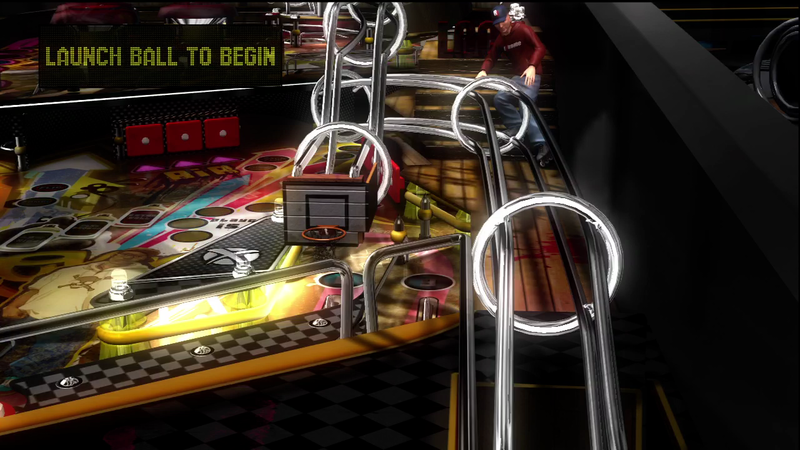 They have successfully replicated the sometimes quirky behavior the ball can have on a real table: stalling behind bumpers, ricocheting off at odd angles, not quite making it up a ramp when you don’t hit it cleanly. Once you really hone your skills you’ll have the ball sailing along slick and smooth, but until then the game doesn’t do you any favors. Gravity, friction, and momentum call the shots. The other thing that the game provides is something I never really had enough quarters to discover on a real machine. In short, pinball tables are complex. On the surface all of those bumpers and panels and ramps are just there to pretty things up and make the ball move around funny, but as you play, you begin to learn the nuances of the machine. Oh, if I get it to go through all four of those lanes, that blocker falls and I can get a multiplier. Oh, if I knock the wrecking ball around to hit the second level, I can activate multiball. That’s the other thing about this game. While attempts have been made to make it as accurate as possible, the very fact that this is still a simulation gives the table designers more options than reality would allow. See, a real pinball table is an engineering marvel. You’ve got servos and solenoids and electromagnets. There are dozens of moving parts and hundreds of relays, and the whole thing has to work reliably and consistently. 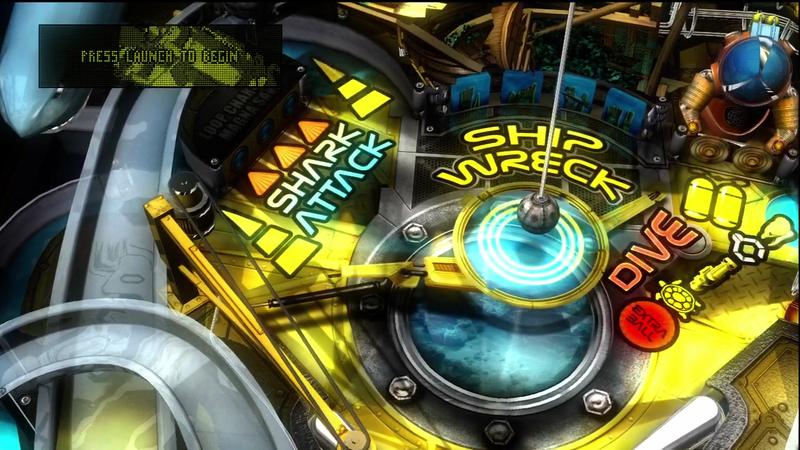 Pinball FX doesn’t have to worry about that. The machines offered up by the game are of a complexity that would make a maintenance man and an arcade owner cringe, sporting magnets and launchers and counterweights that, though possible, would cost a fortune to even attempt to bring to a real table. 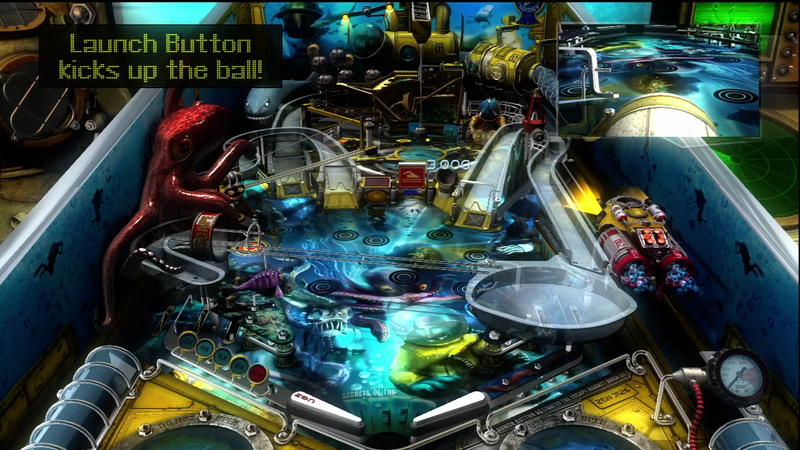 Pinball FX 2, technically, is free. You pay for the core collection, which comes with a handful of tables, and any other available table is capable of being demoed right from the game interface. That means that there is no shortage of new experiences for you. Since the whole point of the game is setting the high score, and you’ve got all of the XBLA playing public to compete against, replay value is virtually endless, even if you discount the multiplayer options. Oh, and evidently this game has 650 achievement points… in an Arcade game. 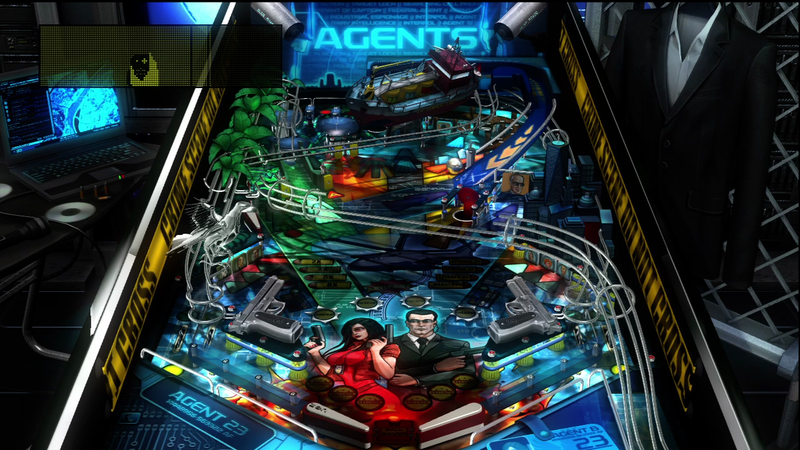 Pinball machines have one of the most recognizable sounds of any modern device, and the developers have done it the same justice as every other aspect of the game. 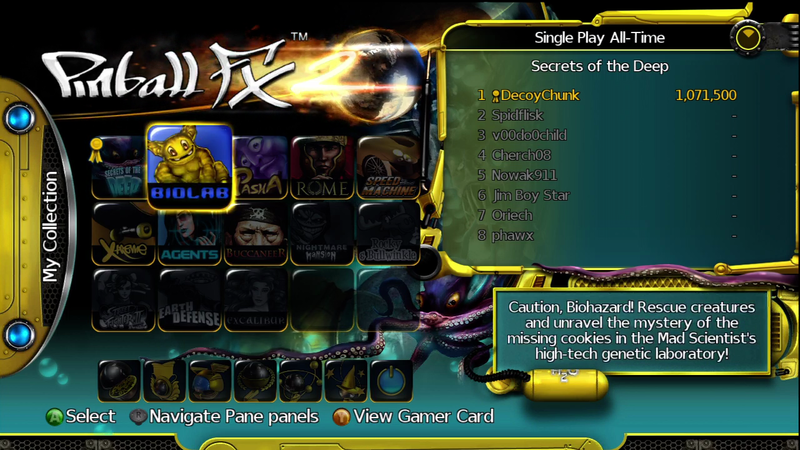 From the sound bite voice recordings to the digital sound effects to all of the mechanical clicks, rattles, and shudders, Pinball FX provides the proper ambiance. Well… it is a bunch of pinball machines. I guess you could pretend that you’re a youngster with endless quarters. Or else you could mute the TV and close your eyes and pretend to be Tommy. I’ve lavished praise upon this game, and it is well deserved, but I should provide a caveat. 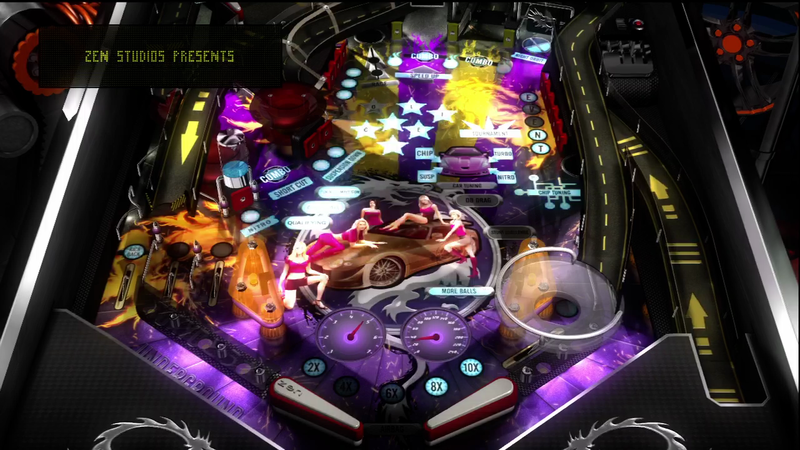 This game does pinball about as well as it can be done, but it is still just pinball. There isn’t any gimmick to it. This isn’t Metroid Pinball. This isn’t Sonic Spinball. It is a metal ball wracking up points. If you aren’t a fan of that, you will not like this game, and there are plenty of people out there who have come to expect more from their XBLA purchases than what many would consider to be a minigame. If you want characters and complexity, look elsewhere. 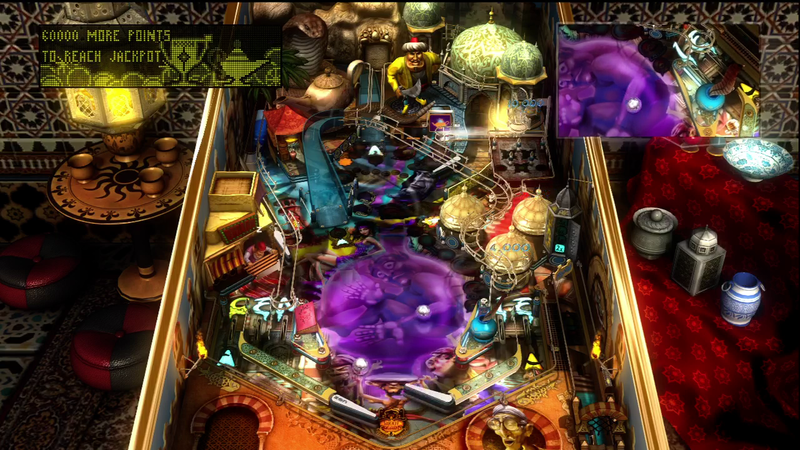 If you long for the quarter plunking arcade machines of old, Pinball FX 2 has got your fix. 8.8 / 10. 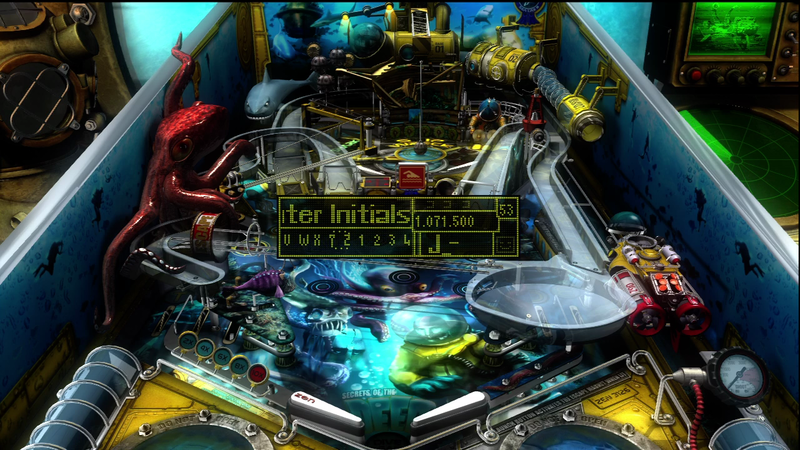 A pure, accurate, entertaining pinball experience. Nothing more, nothing less.